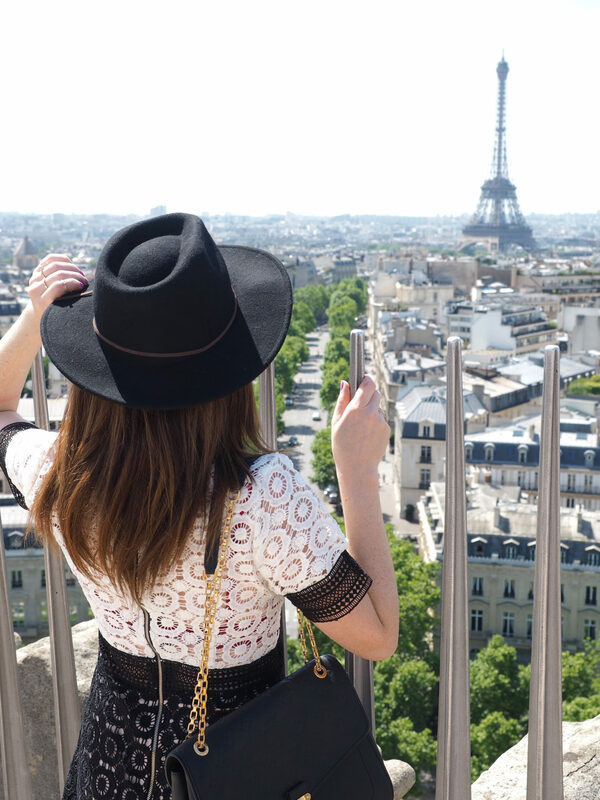 The iconic skyline of Paris would not be nearly as definitive without a view of the Eiffel tower and one of my favourite activities when visiting the city is to continue my never ending quest for the best view. Many will tell you the best view is to be had from Montparnasse (somewhat true), but if you ask me you can beat the secret street view from Avenue de Camoëns. Chances are you’ve heard of the world’s most recognisable museum and it’s most famous work, the Mona Lisa. 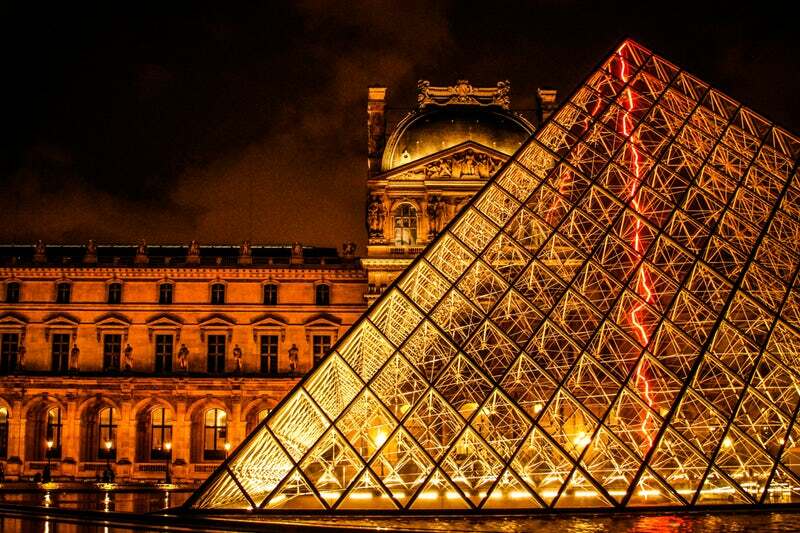 But did you know the Louvre is also home to more than 35,000 pieces of work and 380,000 objects? Not to mention the building’s intricate interiors are a work of art in themselves. 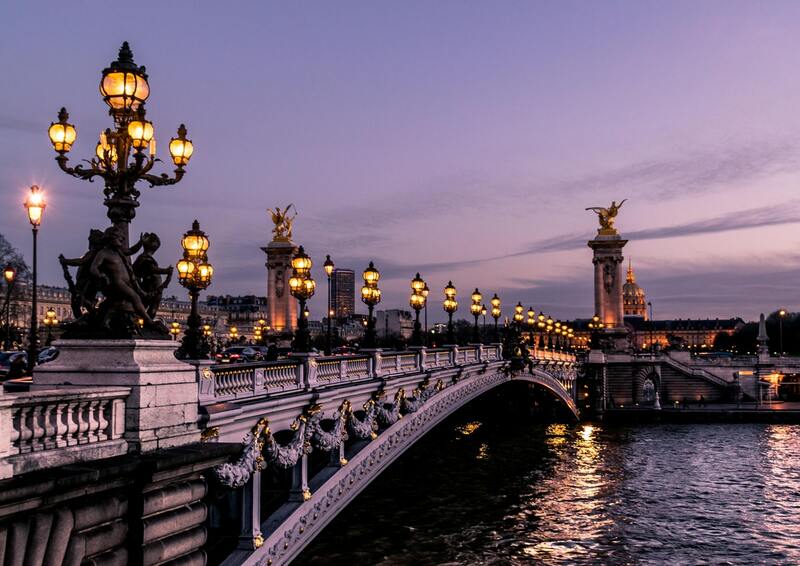 With its gold trimmings and ornate details, the Pont Alexandre III is one of Paris’ most romantic places to watch the sun set or rise on the Seine river. As the sun sets and blue hour settles in, the warm lights turn this bridge in to what could pass as a movie set and indeed, has been the location for many films set in the city. As the centre of Paris, Ile de Cite still feels like the beating heart of the city. 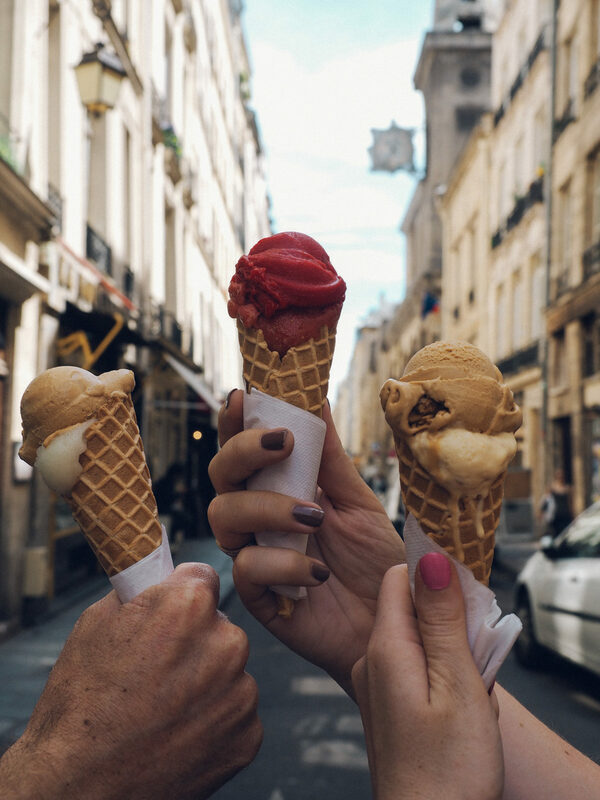 The island is home to an oversupply of ice creameries and quaint cafes, making it the perfect area to explore on a hot summers day as you make the most of the shelter provided by the shadowed buildings and the narrow streets in which they reside. Separating the Right bank from the Left bank, the Seine river will forever be one of the most beautiful places to watch the sun rise over the city of Paris. 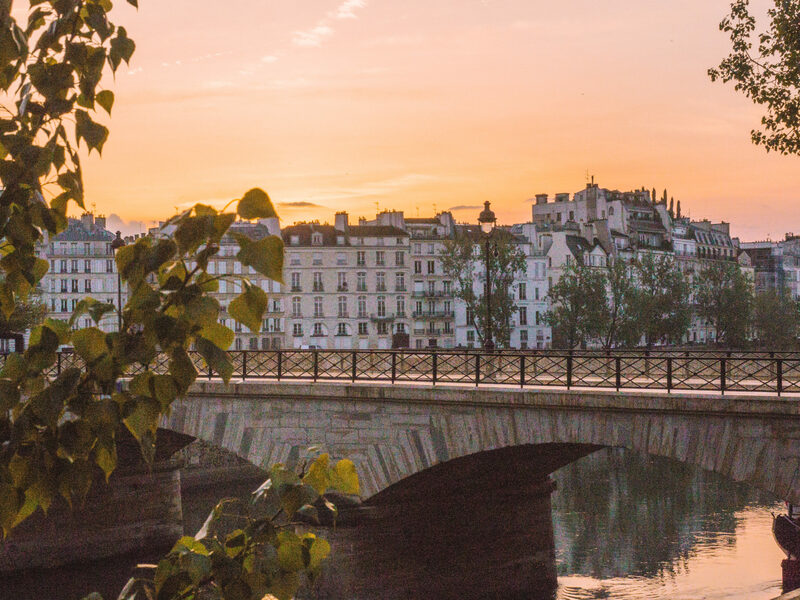 While many visitors to Paris make their way to the Seine for a Parisian picnic at sunset, you can enjoy much of the Seine all to yourself in the early hours of the morning before the city awakes. Concept stores reached their prime in the early 2000’s and while many have since closed their doors, Merci is one of the few that have managed to last the distance. The store is filled with French designers and artisans’ work, with everything on offer from homewares to clothing and everything between. 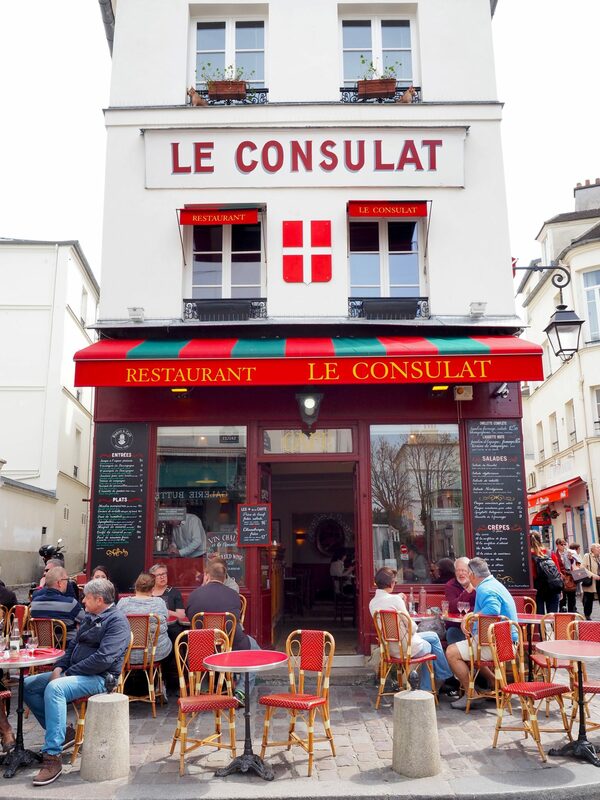 Passing time is an art form in Paris and nowhere is that more idyllic than out the front of a typical Parisian cafe. 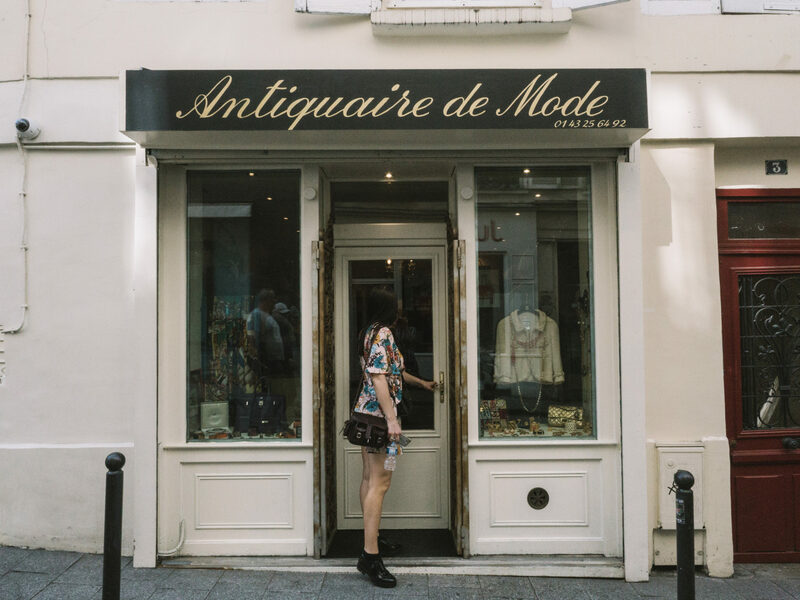 While the famed households names such as Cafe de Flore and Les Deux Magots are filled with well-dressed out-of-towners, you can find the most unique and authentic experiences to be had in the Marais, Saint-Canal-Martin and on the corners of neighbourhoods away from the city’s monuments and museums. Sure, you’ve heard the debate before as to who possesses the best macarons in Paris and more likely than not you’ve had a variety of answers (let’s cut to the chase: Pierre Herme can’t be beat for technique and intense flavours). 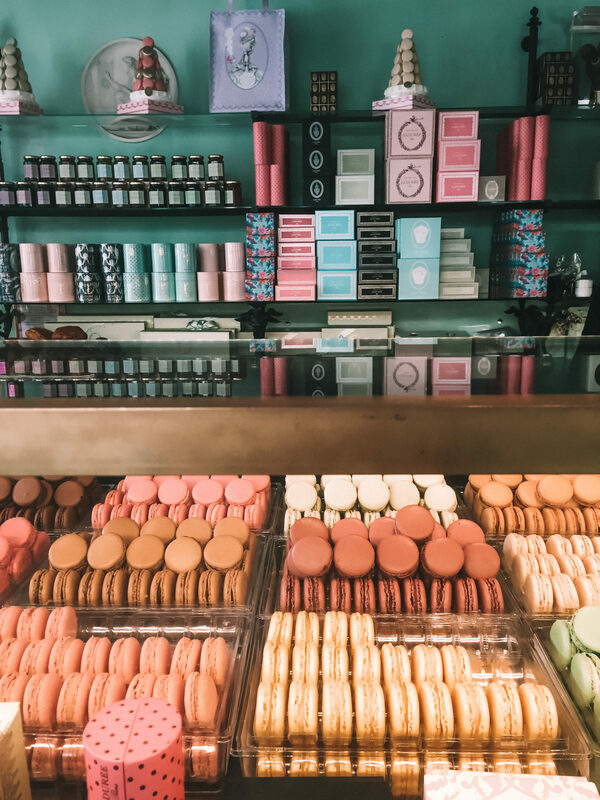 However the original macaron merchant, Laduree, is a Parisian institution in itself and should be visited at least once on your Parisian adventures (just be sure to skip the Champs Elysees location). As the most iconic church in all of Paris, Notre Dame Cathedral is a must see both inside and out. 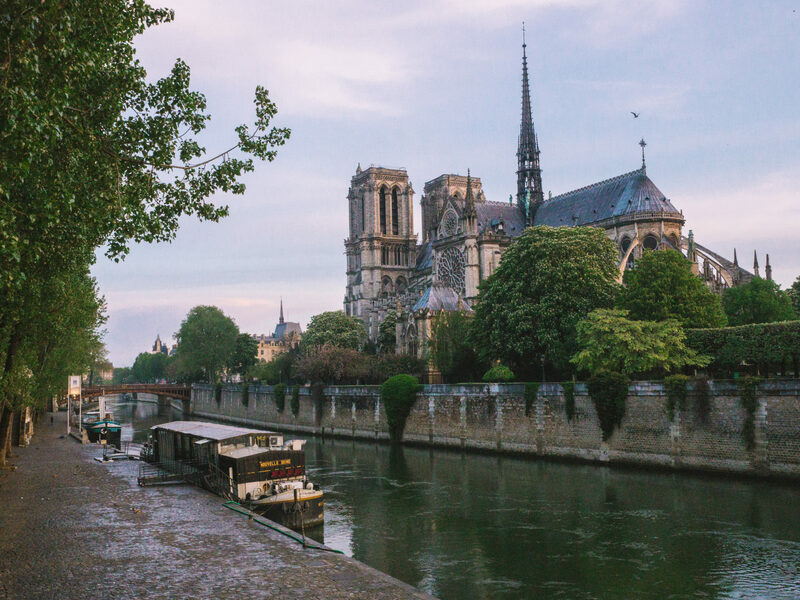 If you’re fit and able, the best view of the cathedral is to be had by climbing the tower stairs, seeing Paris from the same view as the gargoyles that eerily sit atop the towers overlooking the city. 10. Buy a book from Shakespeare & Co. 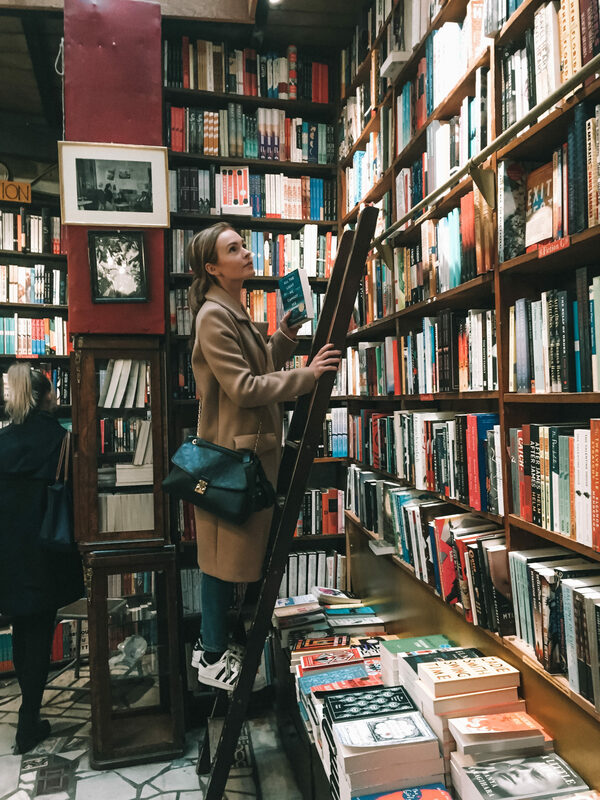 This English bookstore has become one of the most popular pitstops for travellers to Paris – thanks in part to its’ famous inhabitants (the likes of Hemingway and Fitzgerald would visit on the regular during their years in Paris). There are many ways to get around the city of Paris – by bicycle, metro, and by foot are the most popular. Walking the city streets is one of the best ways to see the city and you will often find the journey between destinations is more worth than the destination itself! 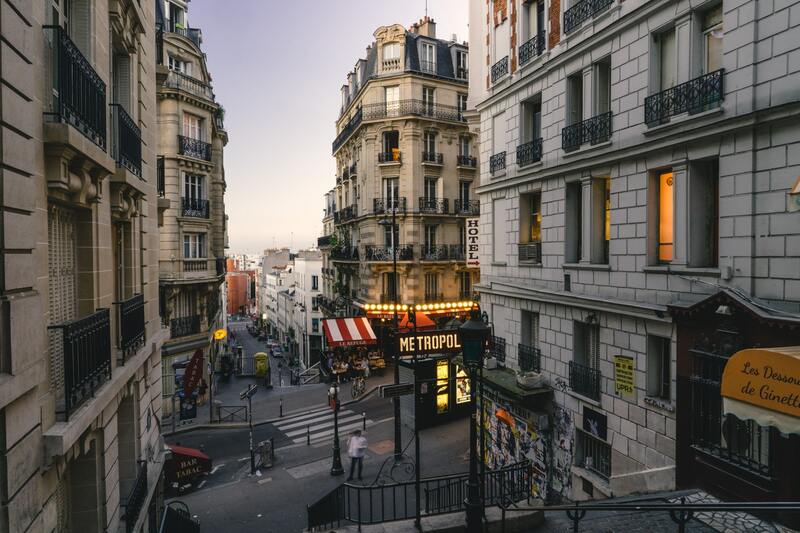 Some of the best neighbourhoods to wander around include Canal-Saint-Martin (less gentrified), Le Marais (bustling on a Sunday) and Montmartre (the artist’s quarter). Unbutton the pants! Paris is a mecca for pastry lovers and indeed, what most would consider the beating heart of French pastry culture. 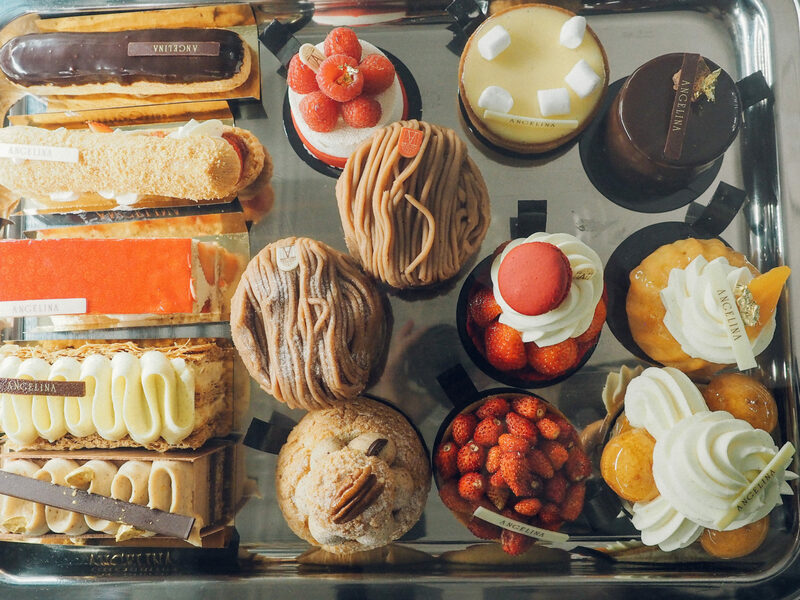 While you’re in town be sure to follow our guide to the best pastry shops in Paris – where you’ll find the best macarons, eclairs, croissants, tarts and more. 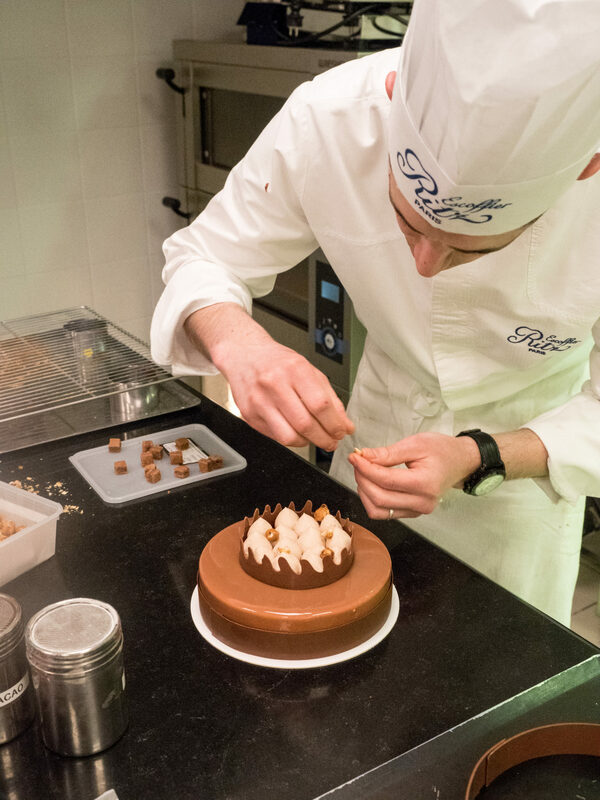 A few years in a row I have made it my duty to attend a new pastry class in Paris and this year was the cherry on the cake: learning to make a chocolate gateau cake in the basement of the Ritz, Paris. These classes are much more expensive and difficult to come by than other classes in Paris (where I learned to make macarons and breakfast pastries), however the skills learned in the four hour class were invaluable. Most of the classes are offered in French but don’t let that scare you – there is an English translator assistant chef on hand to help you through the class. 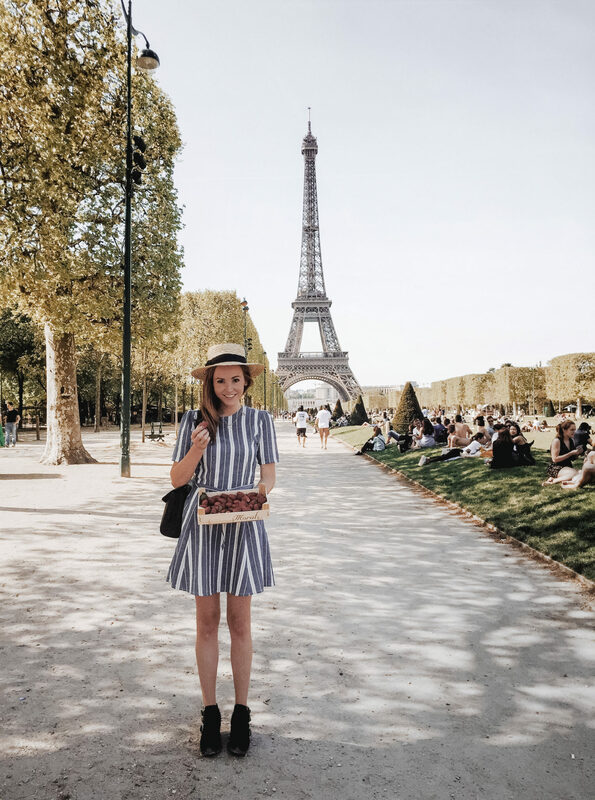 If you plan to visit Paris over the warmer months you absolutely cannot miss the opportunity to park up at the Eiffel Tower on a patch of grass and spoil yourself in some local produce. 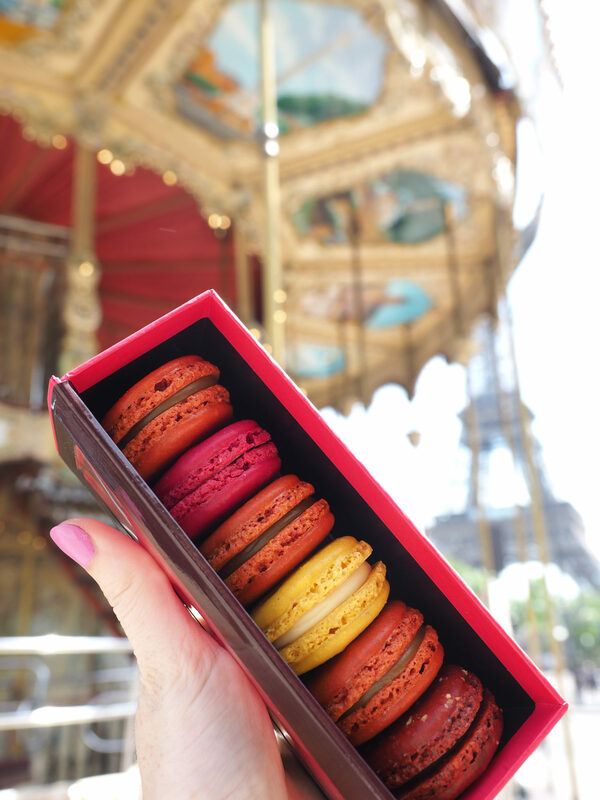 Each year when I visit in spring I do just that – traipsing around the city collecting local wines, cheeses, chocolates and of course, macarons! Situated between the Louvre and the Place de la Concorde are some of the most understated gardens in Paris, yet arguably one of the most beautiful. 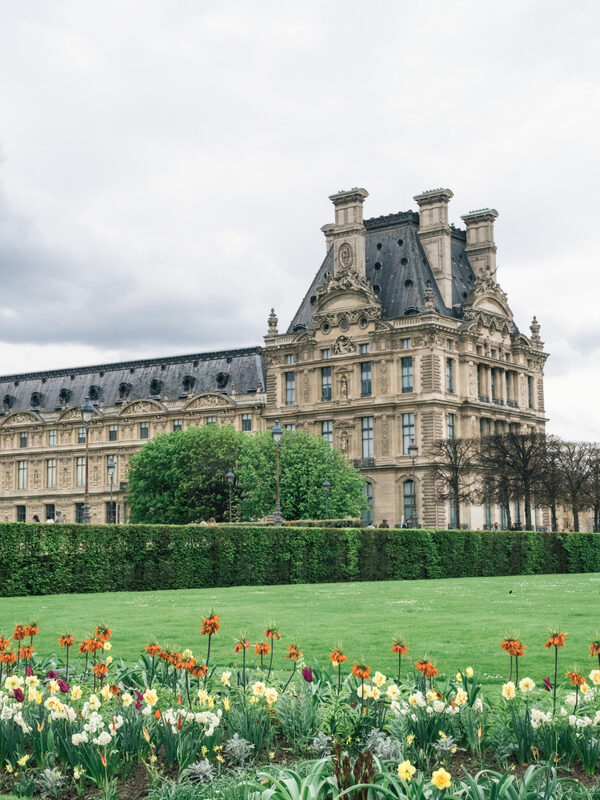 While many visitors to Paris walk through the gardens on the popular route between the Louvre, Place de la Concorde and eventually the Eiffel Tower, many do not make time to stop and spend some time in the gardens themselves. In the Spring and Summer you will find ice cream stalls, a small Paul pastry stand and artists painting their inspiring surrounds. 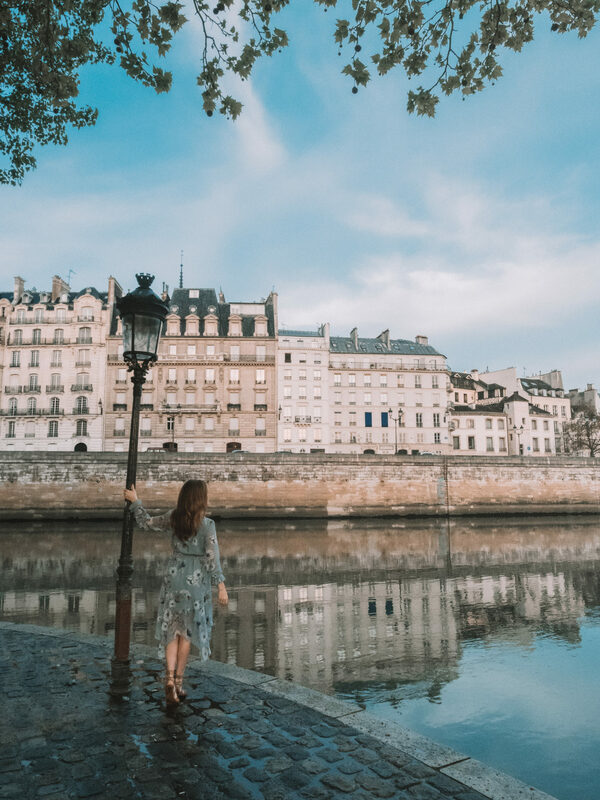 If you’ve checked off the tourist monuments and attractions or simply looking for something a little off the beaten path, check out some of Paris’ hidden passages – an opulent look inside the history of the city. 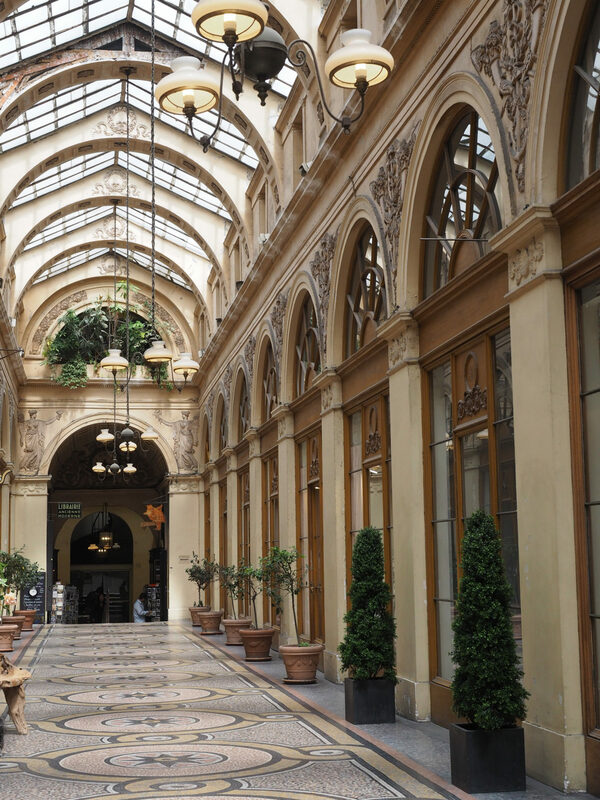 There are a number of passages dotted around the city, with our favourite pick being Galerie Vivienne. 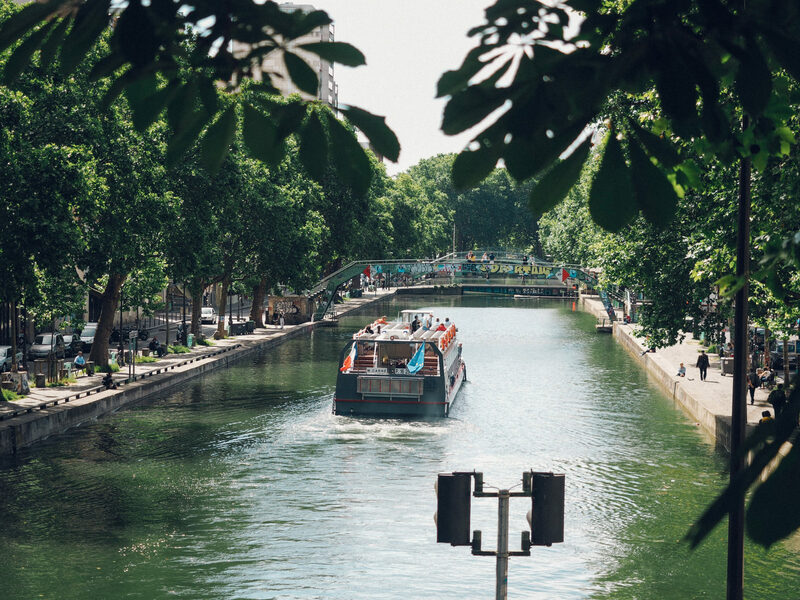 A less gentrified neighbourhood where you can feel a sense of “old Paris” is in Canal-Saint-Martin. This area is full of great boulangeries and small cafes and you can for the most part avoid international chains. Be sure to stop by Du Pain et Idees (Bread and Ideas) for perhaps the best pastries in all of Paris. 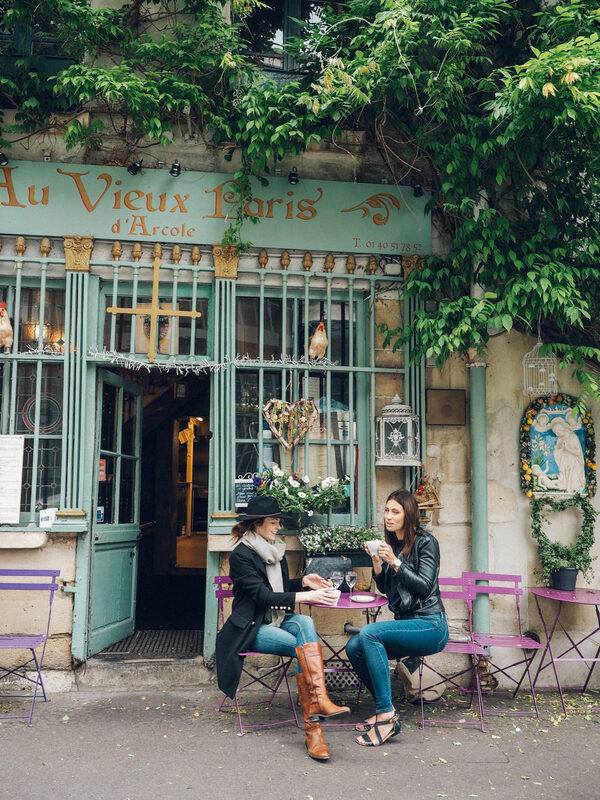 Paris is a mecca for cute little cafes, especially if you go beyond the main streets and explore the hidden alleyways. 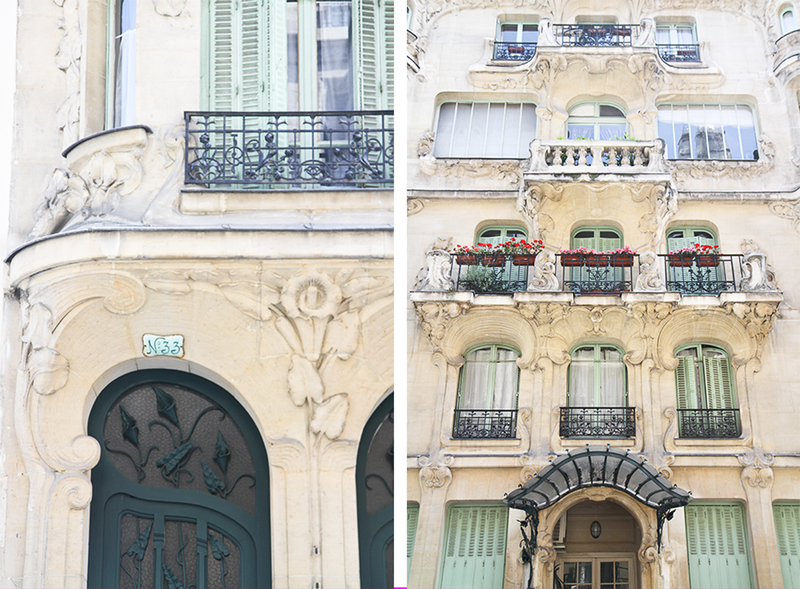 Pictured is Au Vieux Paris, adorned with wildly growing wisteria in the warmer months. To go or not to go? 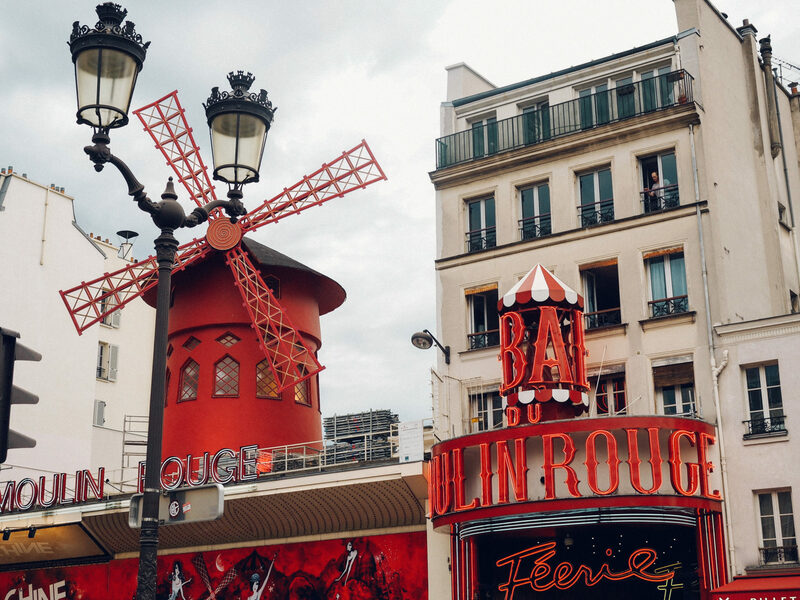 Paris’ most iconic cabaret show, the Moulin Rouge, has been running since 1889 and still to this day attracts a packed house at multiple shows daily. The show is a classic look inside French cabaret shows and if you can stand the tightly packed audience space, is a classic show to see. Alternatives include the Crazy Horse Paris and Lido on the Champs Elysees. 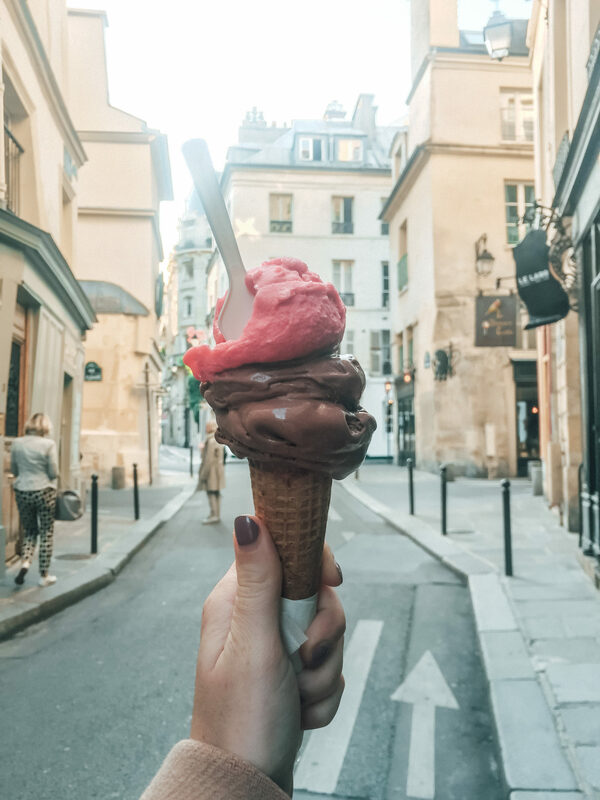 If you find yourself in Paris during the spring/summer, there’s no way you can miss out on a visit to Berthillon, home to the best ice creams and sorbets in Paris. This luxury glacier has built a name for itself in Paris, with a number of locations offering Berthillon throughout Paris. For the best selection head to the flagship location at 29-31 Rue Saint-Louis en l’Île. The sugary almond cookies known as macarons have taken the world by storm in the past decade but have been popular in France since the 19th century. If you don’t want to spend up to $4 per little cookie, book in a macaron making class and learn to make these popular pastries at home. La Cuisine offer a great introductory course as well as a macaron masterclass, where you will learn both the French and Italian methods to making macarons with a qualified French pastry chef. 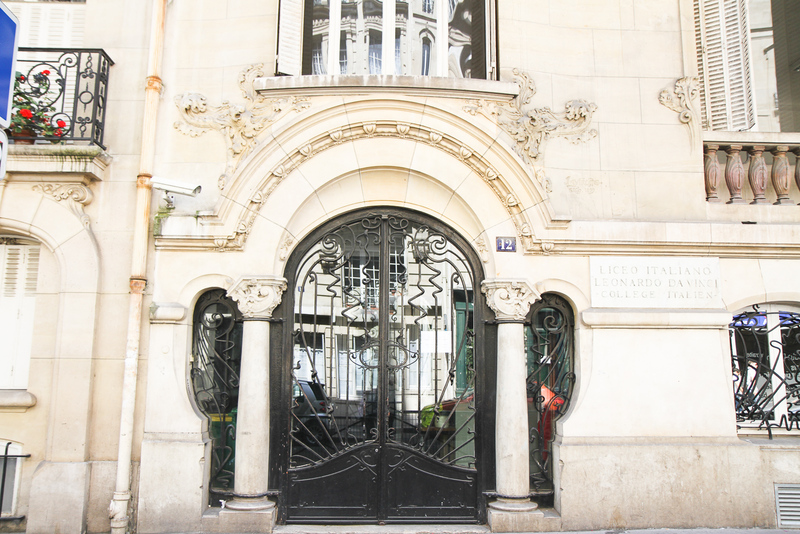 While there are many locations throughout Paris to enjoy views of the Eiffel Tower, arguably the best kept secret location is at the end of Avenue de Camoëns. 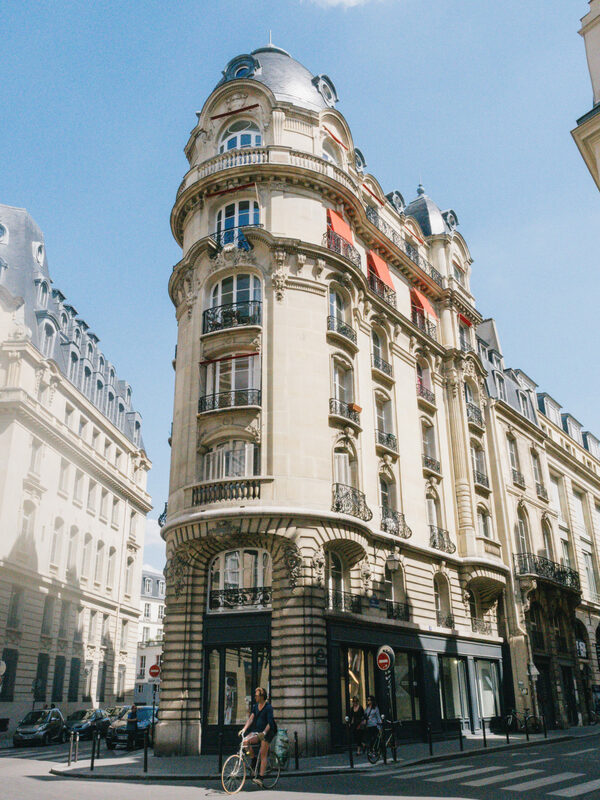 This is a beautiful part of town with some of the most expensive real estate in Paris, so it is also a great chance to explore the neighbourhood. Another great view of the Eiffel Tower is to be had atop the Arc de Triomphe – if you can survive the 284 steps to the top! 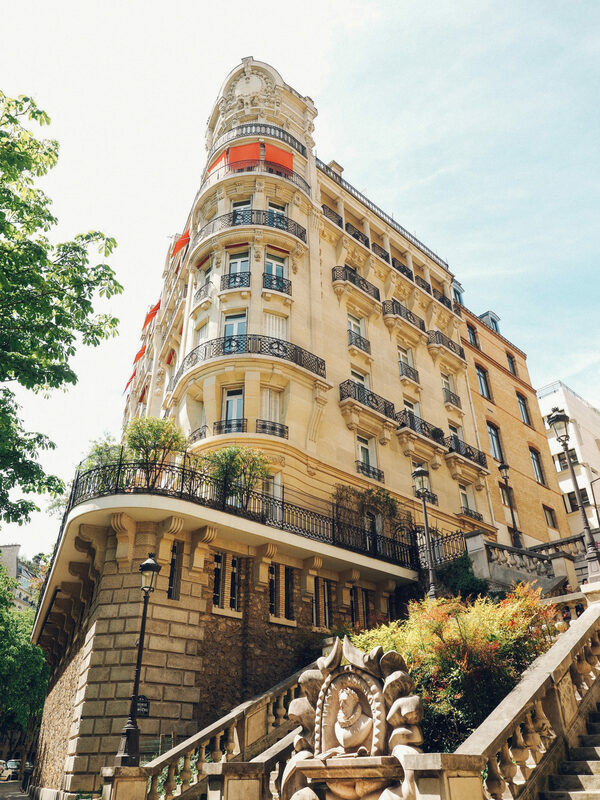 Popular in the late 19th-century to the early 20th-century, Art Nouveau architectural influence has a small but delightful presence in Paris, with some of the most beautiful facades hidden throughout the city. 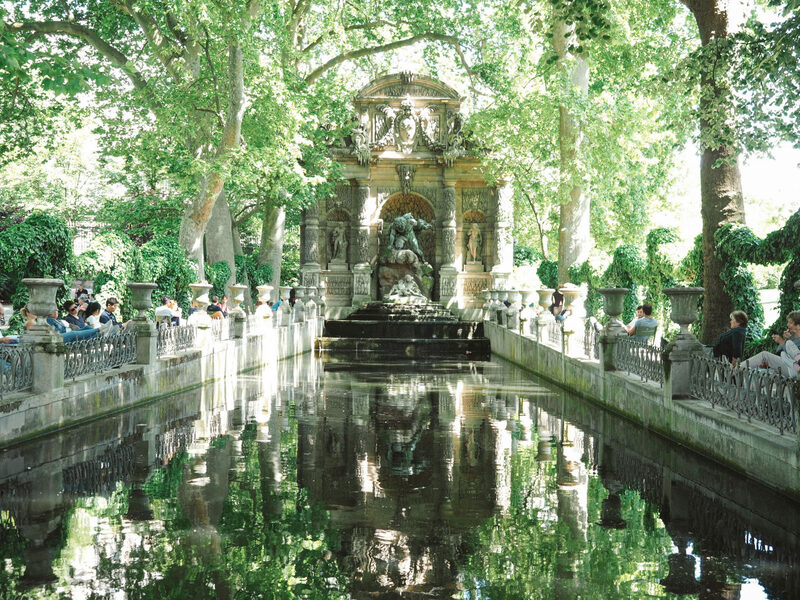 This monumental fountain in the Luxembourg Gardens is one of the prettiest places in the city, especially during the Spring and Summer time. It can be found on the East side of the Luxembourg Palace in a tree-lined, shady area of the park. 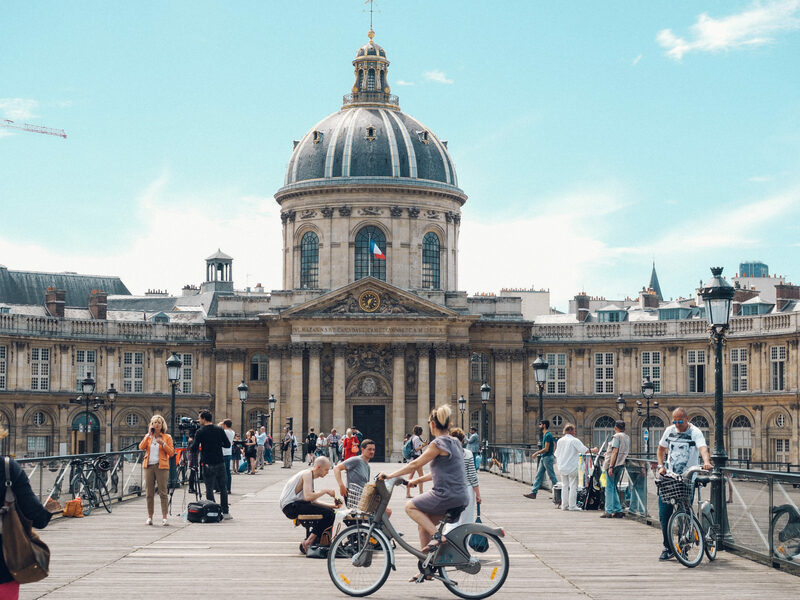 After walking, cycling a bike around the city is another great way to see the city at great length and with the velib system located throughout the city, it is not only an efficient but also affordable way to see the city sights. 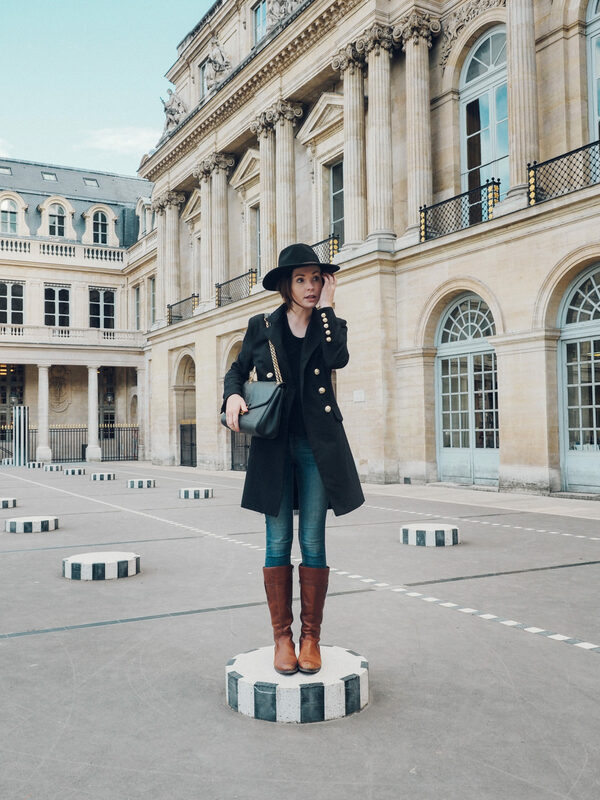 Located in the courtyard of the Palais Royal, Les Deux Plateaux is an art installation better known as the black and white striped columns. The courtyard itself is a beautiful sight to see, but the modern art installation makes it extra special and worthy of a visit. 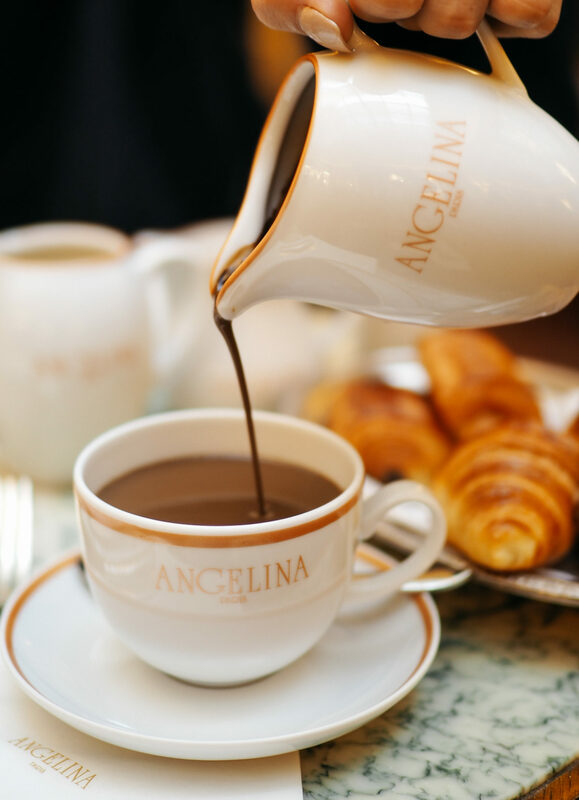 Thick, rich and deliciously indulgent, the hot chocolate (chocolat chaud) at Angelina Paris is an experience in itself. Served in a silver jug that allows you to pour your calories out in front of you, the rich chocolate is best accompanied with a dollop of cream to sweeten to your liking. 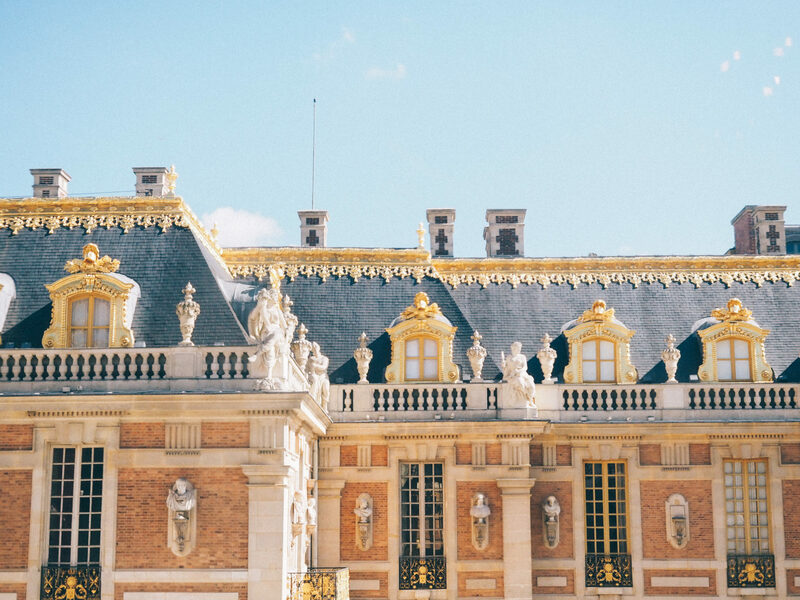 Just half an hour by train from the centre of Paris one can reach the Palace of Versailles, the official royal residence up until the French Revolution in 1789. 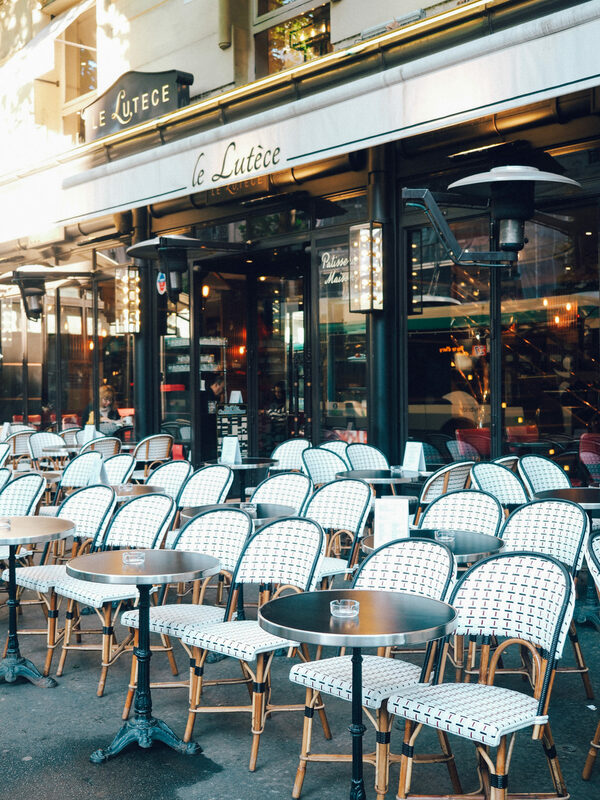 Paris is the ideal city to sit back and people watch, so pull up a chair outside one of the (never ending supply of) cafes and let the world pass you by. Saint-Germain-des-Pres is a great place to start, as well as the perimeter of the Place des Vosges in Le Marais on a Sunday afternoon. That magical time also known as blue hour, dusk is the perfect setting to see the artistic neighbourhood of Montmartre come to life. Just be aware that areas of Montmartre can become pretty sketchy of the evening, so that magical hour doesn’t last long! 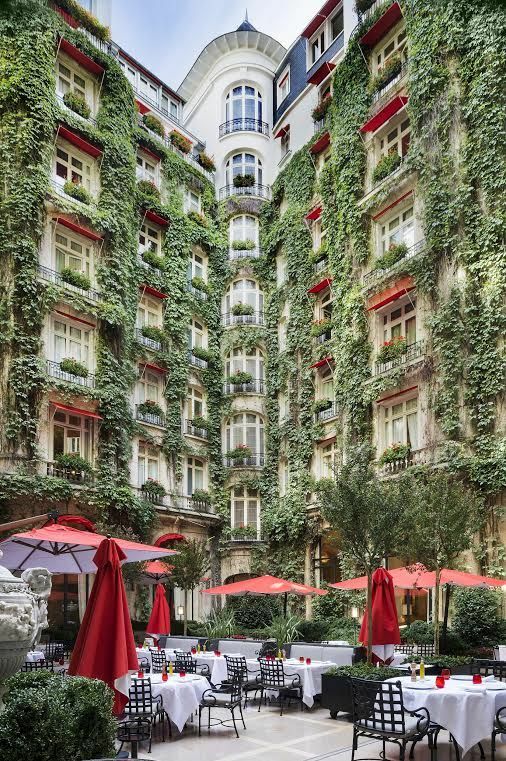 In the warmer months when the courtyards and gardens of Paris spring back to life from the cold winters, there’s a certain sense of renewal throughout the city and nowhere is that more beautiful than inside the courtyard at the Plaza Athénée. This luxury hotel costs a pretty penny to stay the night, but you can experience all the glamour of the hotel by enjoying a luxurious afternoon tea setting in the courtyard. 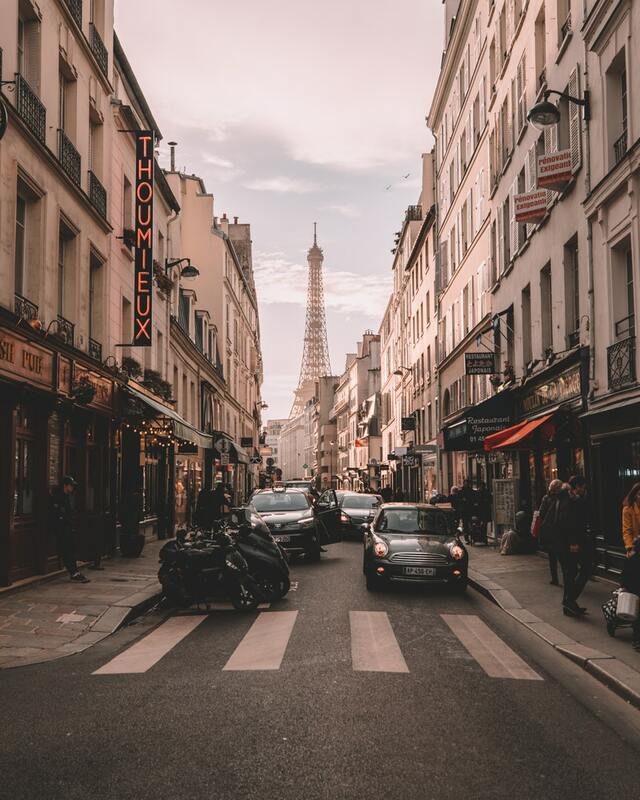 As a predominantly solo traveller (save for a few friends and family members who join from time to time) I often find myself wandering aimlessly around the streets of a city but in Paris I always have a purpose: to find the best views of the Eiffel Tower! Some of my favourite moments have been stumbling upon a cafe with a view directly of the monument or a small street to enjoy all by myself – the list is endless! I won’t list my favourite finds here because the hunt is half the fun! 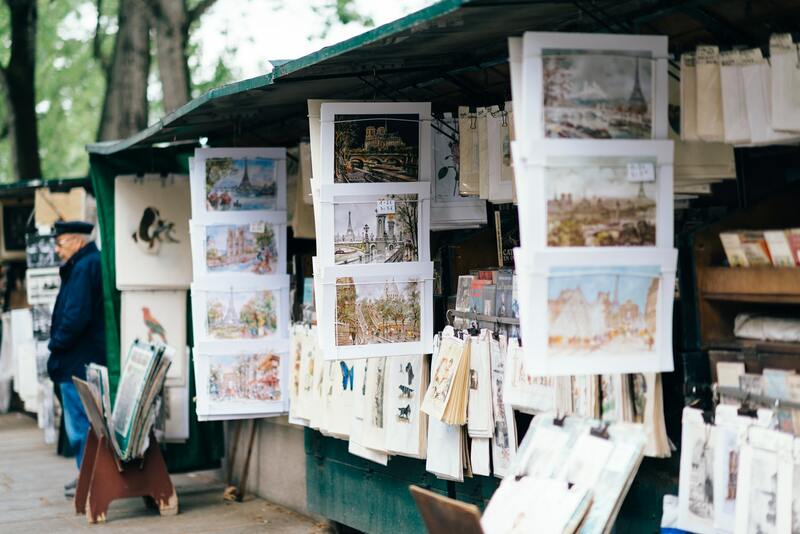 These traditional open-air Seine-side booksellers and art print sellers have been a staple in the landscape of Paris since the 16th century when literacy gained popularity during the Renaissance and these so-called “vagabonds” set up shop on the Seine. To this day this is one of the most popular spots in Paris to score a bargain on a second hand book. One of my all time favourite Paris books, The Only Street in Paris, made me not only realise but understand my love for this neighbourhood in greater depth. 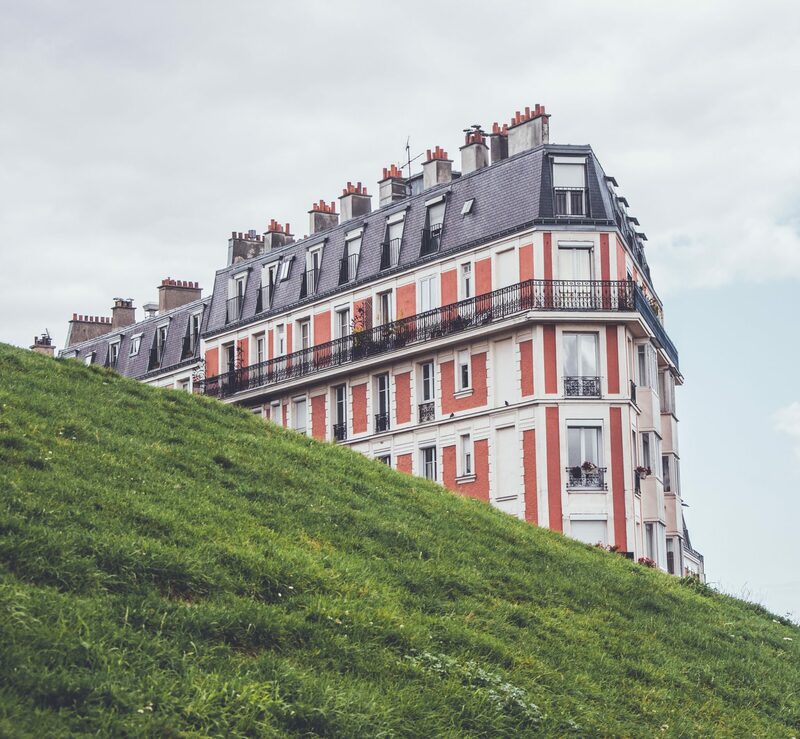 Montmartre and in particular Rue des Martyrs is an insight into the real Paris: a mixing pot of artisans, ethnicities, cultures and traditions. This side of Paris is still very much alive today, though beyond Montmartre has moved further outwards to the outskirts of Paris. Chances are you’ve seen the photos – but the truth is this optical illusion is a house that is not quite sinking, but a great photo opportunity nonetheless. Located at Rue Margaux, the “sinking house” is located right by Sacré-Cœur on the right (if you’re looking at it). 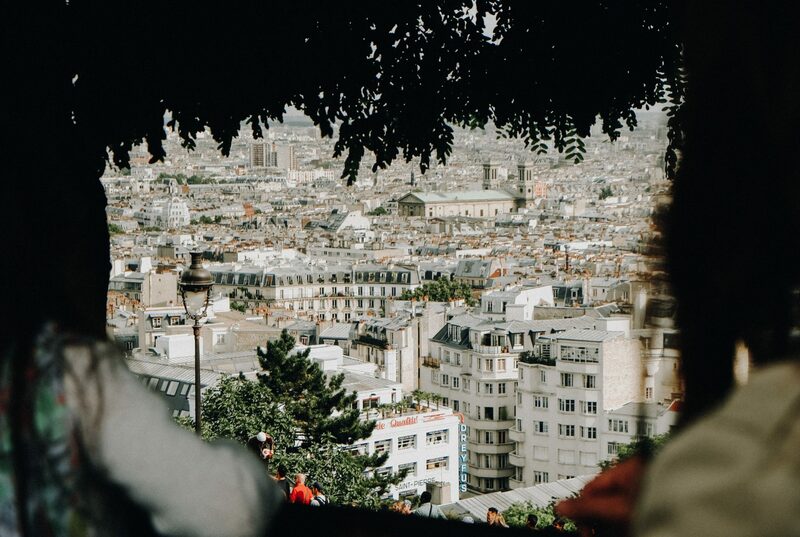 Whilst in the neighbourhood, be sure to make your way to the famous Sacré–Cœur Basilica and make your way around the hilltop overlooking the city to take in the sweeping views of the city. 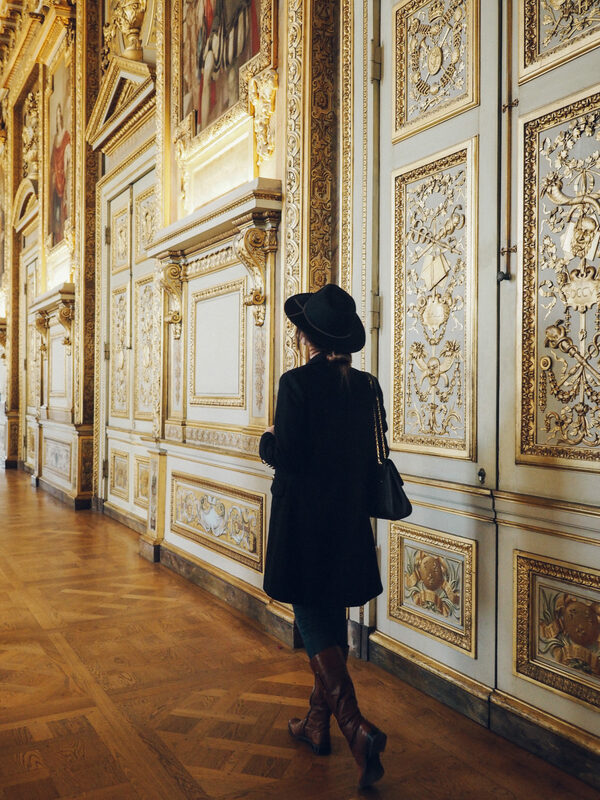 Whether you’re seeing a ballet, opera, or simply taking a tour of the impeccable interiors, you must absolutely take in the Paris Opera House at some point during your visits to Paris. 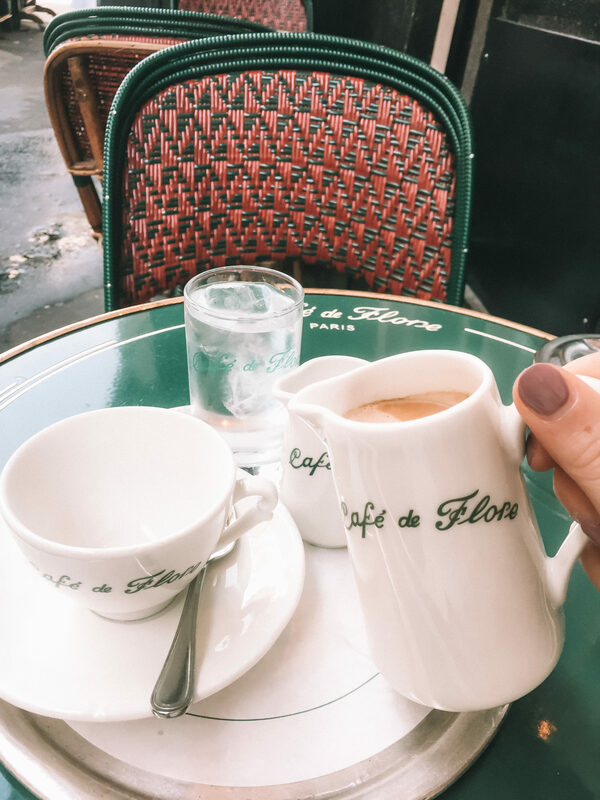 As one of Paris’ most renowned cafes (alongside its’ neighbour Les Deux Margots), Cafe de Flore is an experience in itself, as well as a people-watching mecca worth waiting for a table for! 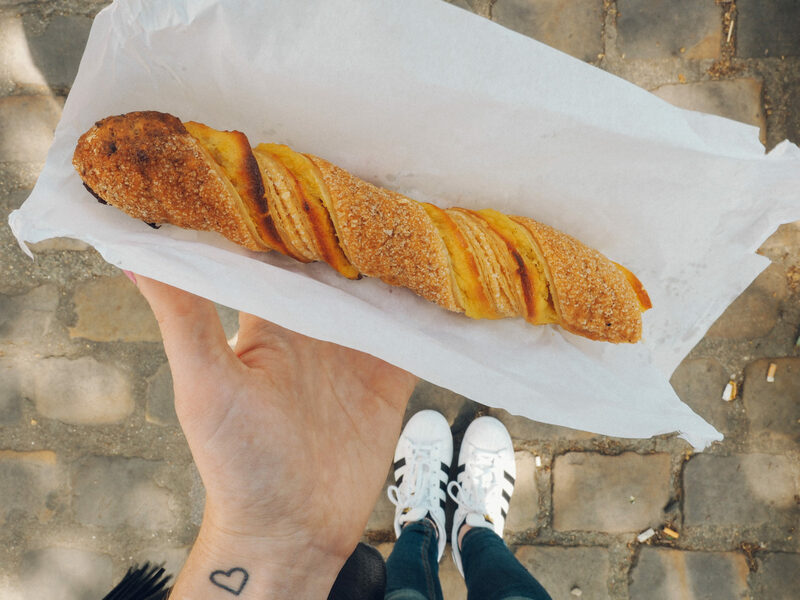 If you’re in Paris on a budget then look no further than the Latin Quarter, a maze of cheap street eats at your disposal. From crepes to kebabs and everything in between, there are endless food options on offer all for the bargain price of a few euros. Looking for a vintage Chanel blazer or a pair of clip-on earrings from the 1950’s? Saint Germain is where to go! This neighbourhood is full of boutiques selling all kinds of vintage goodies, especially if you’re looking for labels. 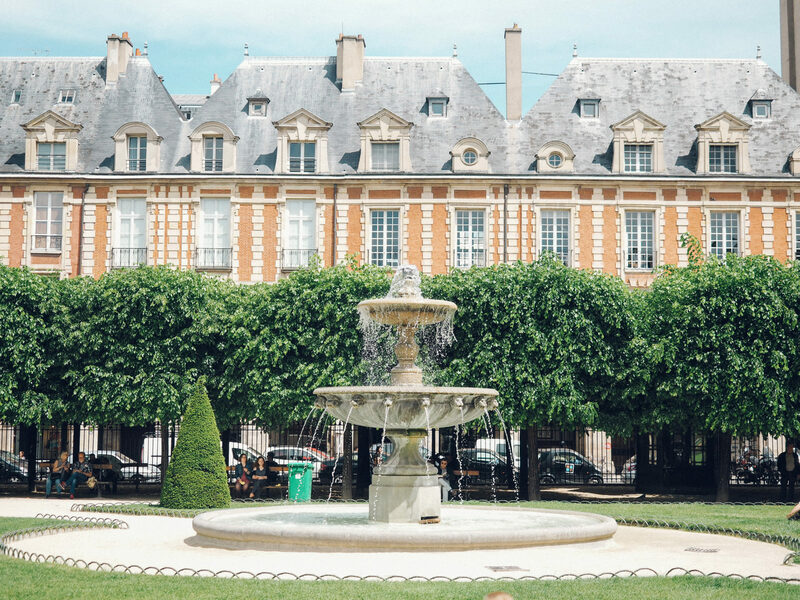 One of my all time favourite places to perch myself on a weekend (especially if the sun is out) is Place des Vosges, arguably the prettiest public square in all of Paris. Grab yourself some baked goodies from one of the patisseries surrounding the square (my favourite is Carette) and let time pass you by as you soak in the opulent surrounds. Chances are you’ve seen it, plan to visit it, but did you know you can also go inside? This Basilica is one of Paris’ most visited monuments but more often than not visitors stay on the outside, getting so caught up in the view of the city that they forget to go inside! If you’re anything like me the only diet you’ll be on in Paris is precisely no diet at all, so make your way to Angelina and stock up on some goodies. 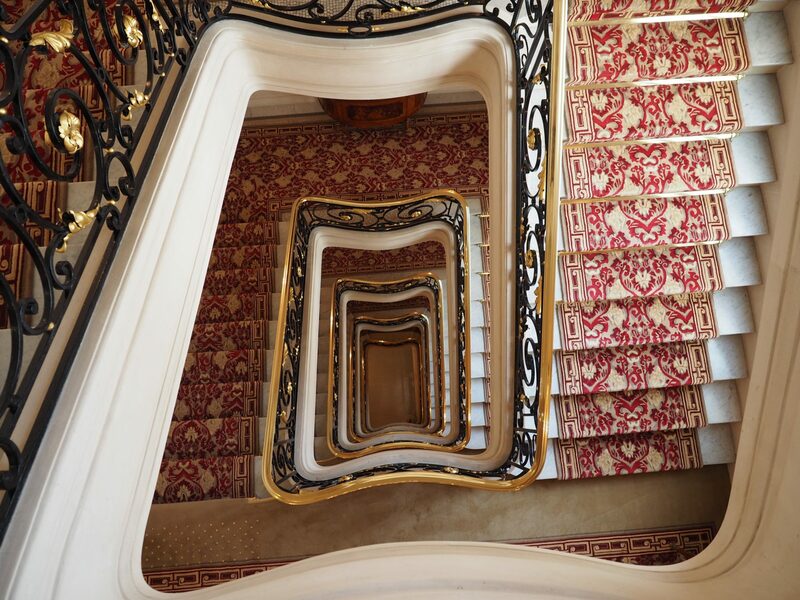 One of my favourite and often under-appreciated features of Paris is the attention to detail taken in the staircases of beautiful apartment blocks and Paris’ most luxurious hotels. 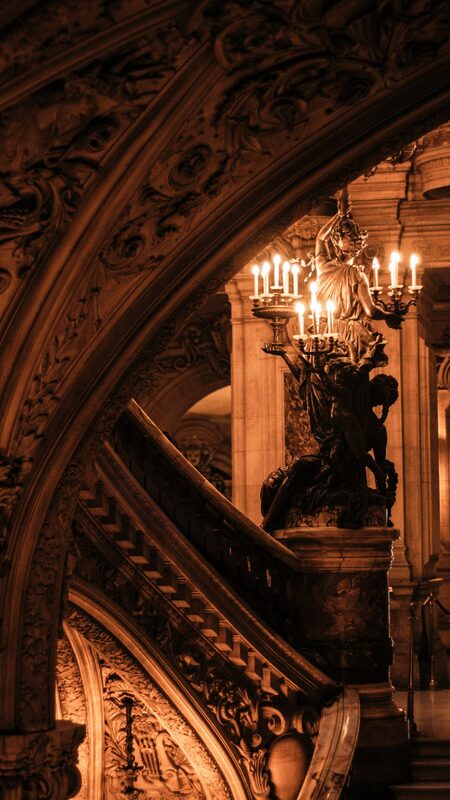 The above pictured staircase is located inside Plaza Athénée, one of the most iconic hotels in the city. 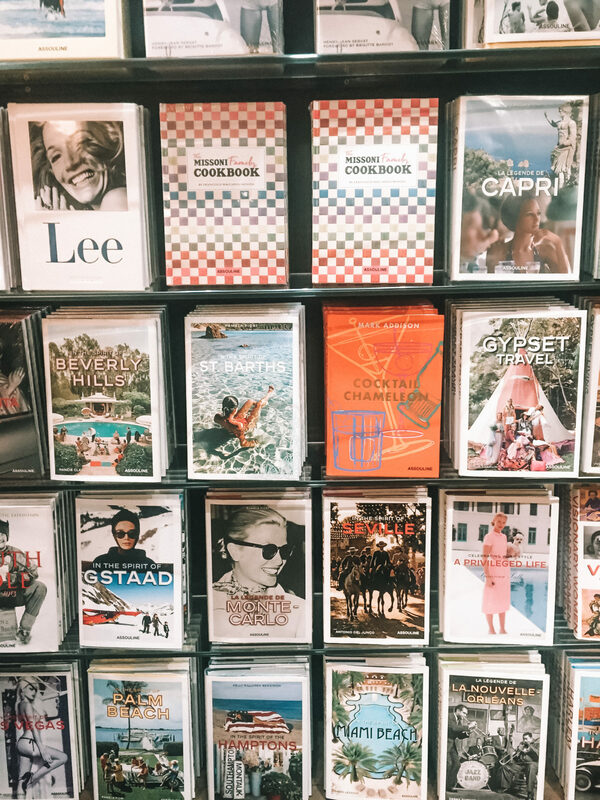 If you’re after a gift for that hard-to-buy-for person or in search of the perfect coffee table book, then look no further than Assouline in Saint Germain des Pres. 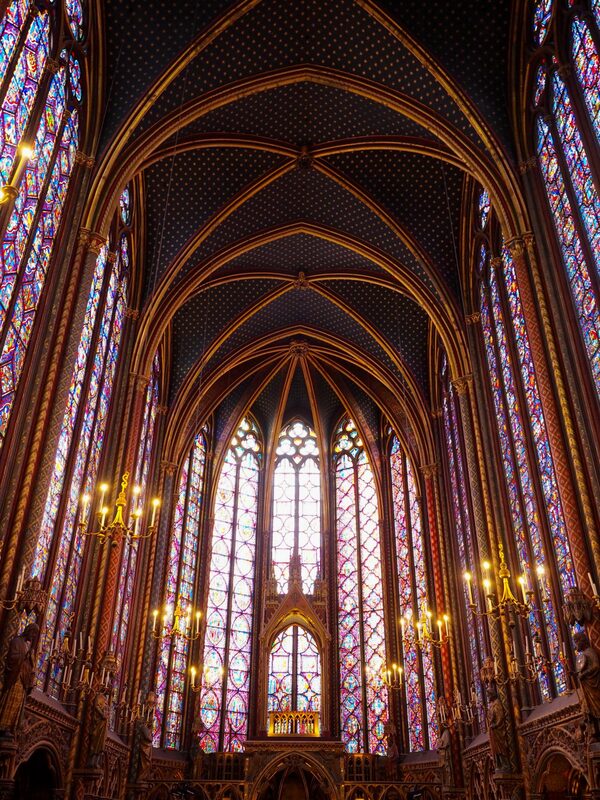 Built in the early 13th Century, Sainte-Chapelle chapel is home to one of the most gorgeous displays of stained glass you will find the world over. 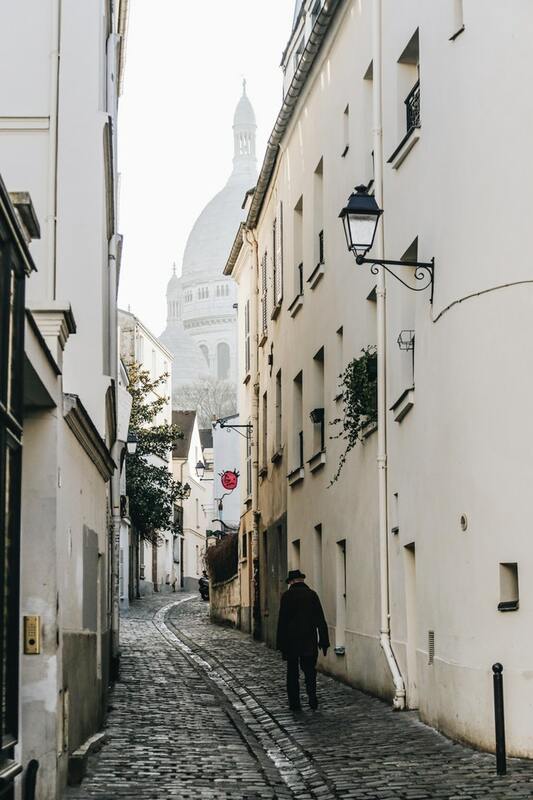 On weekends especially the neighbourhood of Montmartre comes to life and nowhere is that more true than the artist’s district. 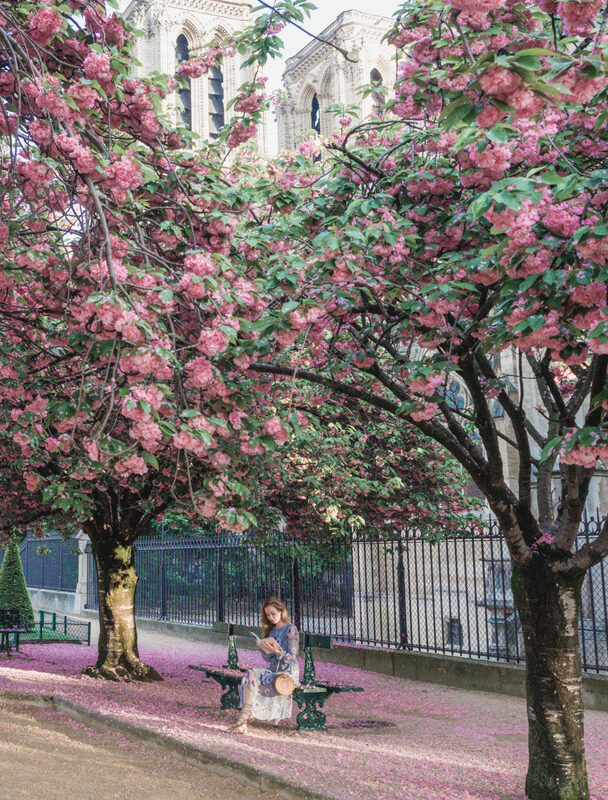 While it only lasts a couple of weeks every April, there is no better way to see Paris than in a blanket of pink cherry blossoms wistfully blowing in the light breeze of Spring. 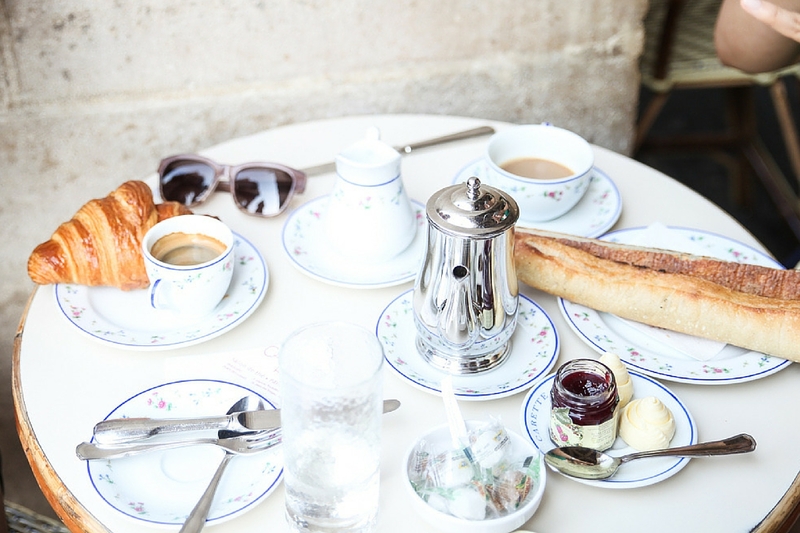 As my all-time favourite cafe in Paris (chances are if you’ve heard of it before elsewhere on World of Wanderlust), I cannot finish this article without recommending Carette. There are two locations in the city (one in Trocadero and one in Le Marais), with my favourite being the latter. Over to you! 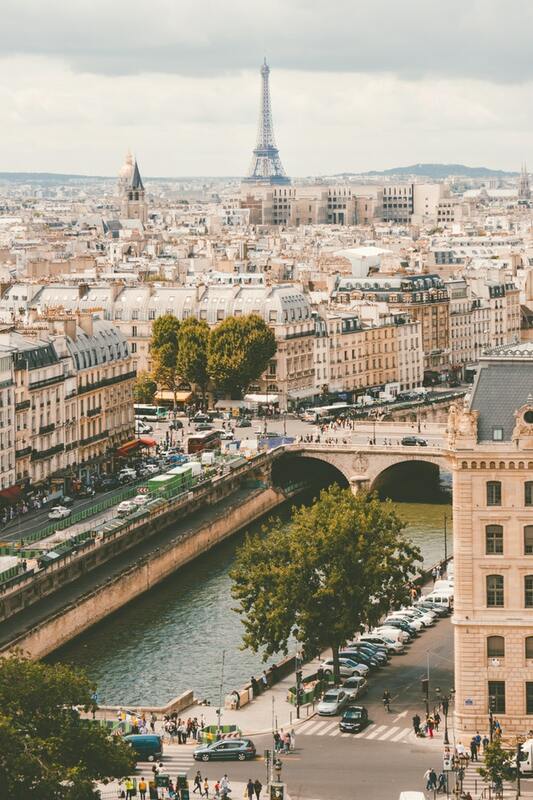 What are your favourite things to do in Paris!? What an amazing list! I’m saving this for next time I go to Paris to refer back to 😀 also the imagery in the post is stunning!! Okay, so it’s obvious I need to get back to Paris! I love Paris, such a beautiful place! Paris is such a fascinating and unique place, everything just so amazing !! Definitely love it.